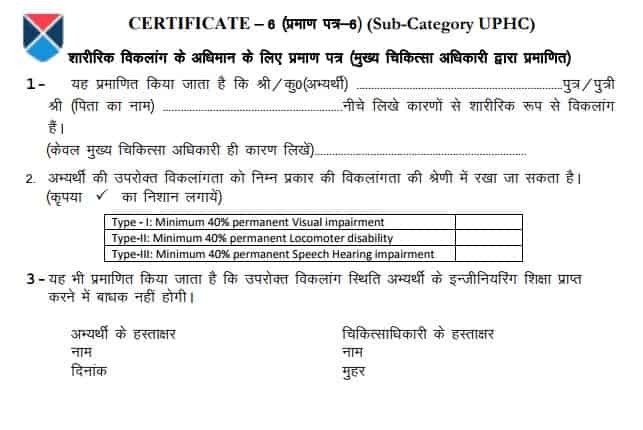 Original & photocopy of UPTU 2019 Admit card. Minimum of 4 to 6 latest passport size photographs. Original and attested copy of all the qualifying examination certificate. 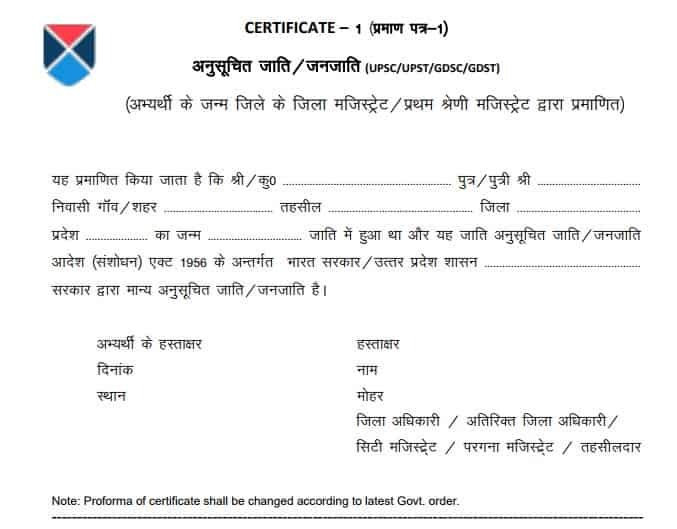 Domicile Certificate of Uttar Pradesh (if applicable). 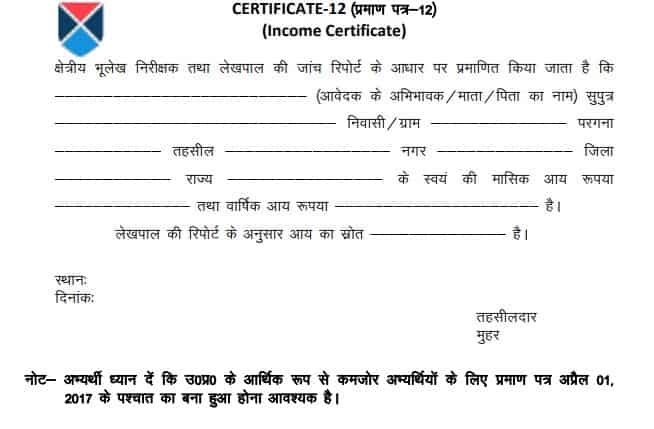 Income certificate for economically weak candidates. (if applicable). Minimum Qualifying Marks: Candidates who have successfully scored minimum cutoff percentage (25%) shall be called for UPSEE/AKTU/UPTU 2019 counselling according to their rank in the merit list. However, the allotment of seat shall depend on the availability of the seats on the day of counselling. UPSEE Counselling Fee Refund: The fee paid at the time of UPSEE counselling by the candidate after the allotment of seat will be final and will not be refunded under any circumstances even if the candidate does not report for the admission to the allotted institutions. Date: The successful candidates will have to take part in the UPSEE/AKTU/UPTU 2019 counselling process which will begin from 25th June 2019. There will be four rounds of counselling in total. NOTE: UPTU counselling date rank wise will be out and conveyed to the qualifying candidates. Keep a check with the official website for the same. UPSEE/AKTU/UPTU 2019 Counselling 1st Round: Commencement of registration and choice filling. Last date of registration for UPSEE/AKTU/UPTU 2019 Counselling 1st round. UPSEE/AKTU/UPTU 2019 Counselling 1st Round: Document Verification. UPSEE/AKTU/UPTU 2019 Counselling 1st Round: Seat Allotment. UPSEE/AKTU/UPTU 2019 Counselling 2nd Round: Commencement of registration and choice filling. Last date of registration for UPSEE/AKTU/UPTU2019 Counselling 2nd round. UPSEE/AKTU/UPTU 2019 Counselling 2nd Round: Document Verification. UPSEE/AKTU/UPTU 2019 Counselling 2nd Round: Seat Allotment. (UPTU/AKTU) UPSEE 2019 Counselling 3rd Round: Commencement of registration and choice filling. Last date of registration for (UPTU/AKTU) UPSEE 2019 Counselling 3rd round. (UPTU/AKTU) UPSEE 2019 Counselling 3rd Round: Document Verification. (UPTU/AKTU) UPSEE 2019 Counselling 3rd Round: Seat Allotment. (UPTU/AKTU) UPSEE 2019 Counselling 4th Round: Commencement of registration and choice filling. Last date of registration for UPSEE/AKTU/UPTU 2019 Counselling 4th round. UPSEE/AKTU/UPTU 2019 Counselling 4th Round: Document Verification. UPSEE/AKTU/UPTU 2019 Counselling 4th Round: Seat Allotment. Downloading the Provisional allotment letter for (UPTU/AKTU) UPSEE 2019 Counselling. Reporting to Allotted Institutes for Admission. List of Seats Allotment Result List of (UPTU/AKTU) UPSEE 2019. 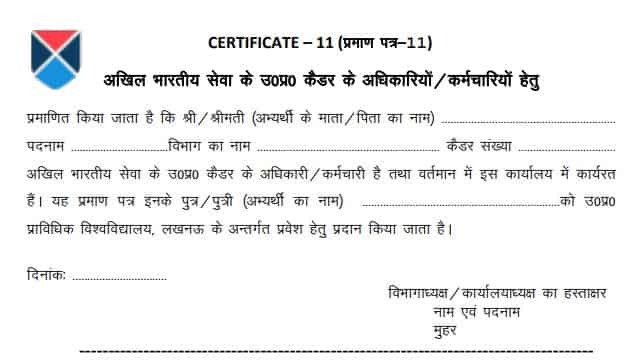 SC/ ST Certificate: Candidates who selected UPSC/UPST/GDSC/GDSC in the category section of (UPTU/AKTU) UPSEE 2019 application form should submit community certificate signed by the authorized authority. 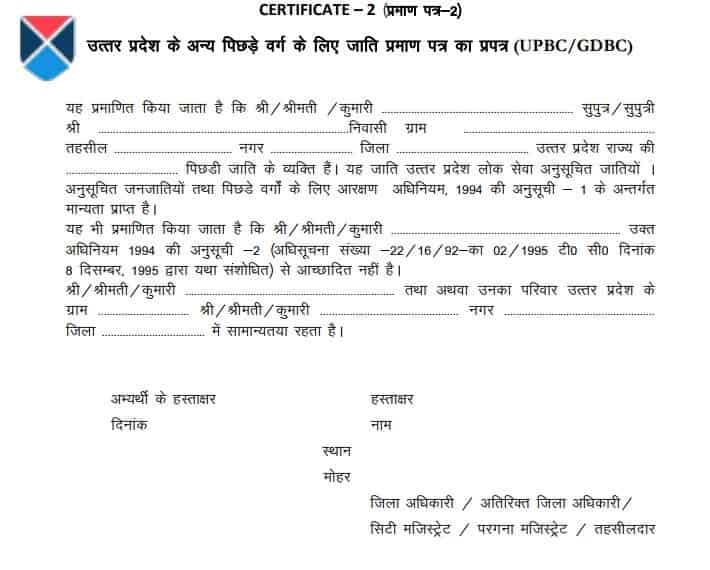 OBC Certificate: Candidates who selected UPBC/GDBC in the category section of (UPTU/AKTU) UPSEE 2019 application form should submit community certificate signed by the authorized authority. 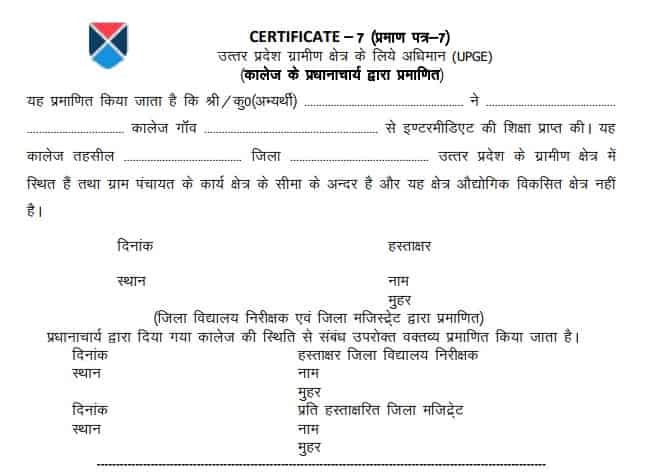 Domicile Certificate: Candidates who have selected UPGD/GSC/GDSC/GDBC in the category section of (UPTU/AKTU) UPSEE 2019 application form and whose parents are the domicile of Uttar Pradesh should submit domicile certificate to claim reservation benefits. 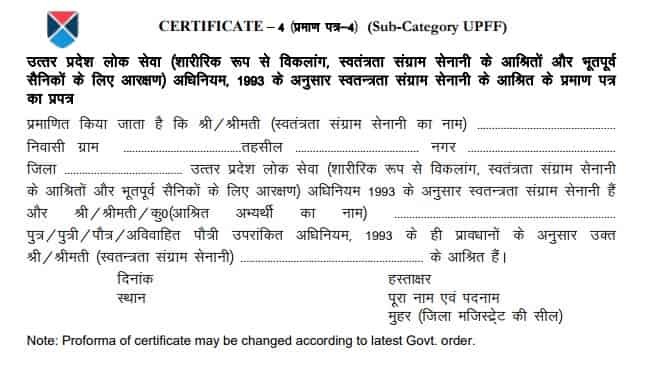 Dependents of Freedom Fighter: Candidates who have selected UPFF in the sub-category section of (UPTU/ AKTU) UPSEE 2019 application form should submit relevant certificate at the time of document verification. 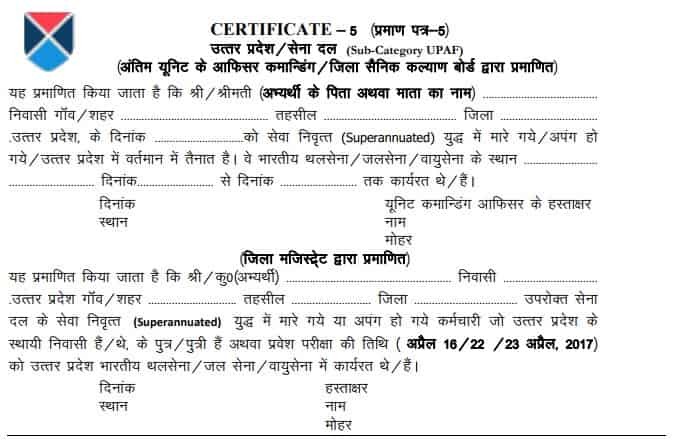 Son/Daughter of Defence Personnel: Candidates who have selected UPAF in the sub-category section of (UPTU/AKTU) UPSEE 2019 application form should submit relevant certificate at the time of document verification. Type 1: Minimum 40% permanent Visual impairment. Type 2: Minimum 40% permanent Locomotors disability. Type 3: Minimum 40% permanent speech and Hearing impairment. Rural Weightage: Candidates who selected UPGE in the category section of (UPTU/AKTU) UPSEE 2019 application form and want to claim seats reserved for the rural applicant should submit relevant certificate at the time of document verification. Dominance: A weightage of 3% of the total marks obtained at (UPTU/AKTU) UPSEE 2019 will be given to UPGE candidates for B.Tech/ B.Pharm/ B.Arch/ BHMCT/ BFAD/ BFA/ courses and who have passed the qualifying examination from an institution situated in rural area of Uttar Pradesh. The institutions should be situated in the jurisdiction of Gram Panchayat but the area should not be industrially developed. Note: Rural weightage is not applicable for candidates under UPGD category and a candidate opting any other reservation benefits and for the candidate opting direct admission to the second year. 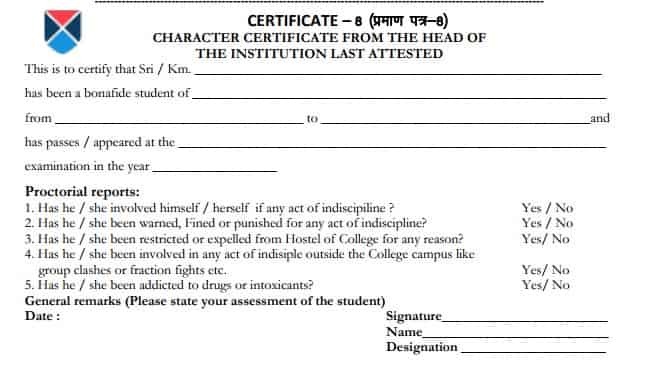 Character Certificate: Candidates should submit the character certificate issued by the institute/college from where s(he) has pursing or completed their qualification. 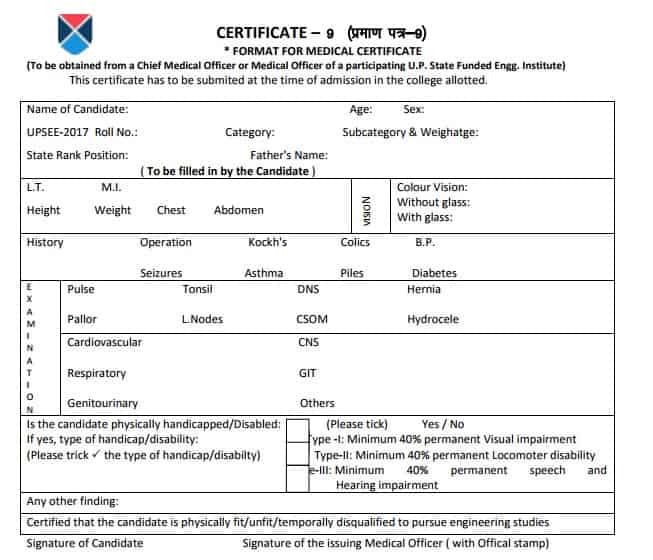 Declaration Certificate: Candidate should submit the declaration certification mentioning about their medical fitness and they are fully capable of the pursuit of studies in the courses in which they were seeking admission through (UPTU/ AKTU) UPSEE 2019. 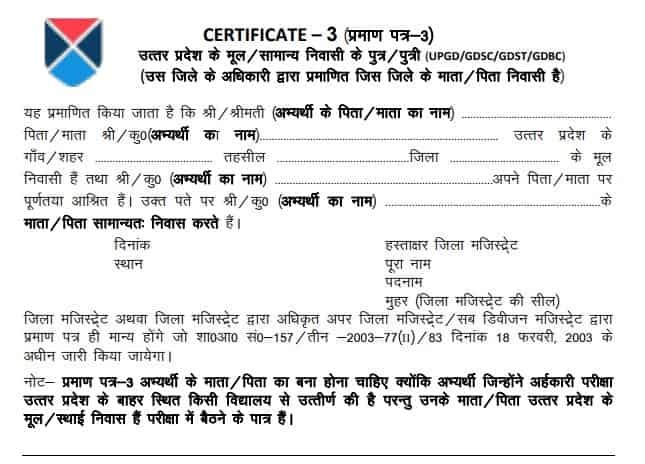 All India Service: Candidates who have selected GDDA in the category section of (UPTU/ AKTU) UPSEE 2019 application form and who is the employee of All India Services belonging to Uttar Pradesh cadre should submit the relevant certificate at the time of (UPTU/AKTU) UPSEE 2019 counselling to claim reservation benefits. Income Certificate: As per AICTE notification fee waiver seats for economically weaker meritorious candidates are also available in B.Tech/ B.Pharm/ B.HMCT/ B.FAD/ BFA courses in all institutions affiliated to AKTU, Lucknow. No tuition fee will be charged from the candidates admitted to such seats. The fee waiver seats will be limited to the maximum of 5% of the approved intake in the course and will be over and above of the sanctioned intake. The economically weaker students must submit income certificate at the time of (UPTU/AKTU) UPSEE 2019 verification of documents. Admit Card: Candidates should submit the (UPTU/AKTU) UPSEE 2019 Admit Card which should have the signature of the invigilator of examination centre. Rank Card: Candidates should carry the photocopy of the (UPTU/AKTU) UPSEE 2019 Rank Card which will be published on the official website after the declaration of results. Mark Sheet: Candidates should carry the original and attested copy of Class 10th, Class 12th, and all the equivalent qualifying examination certificate & marks sheet. Photograph: Candidates should carry around 4 to 6 passport size photograph which they have used to upload in (UPTU/AKTU) UPSEE 2019 application form while they go for document verification of (UPTU/AKTU) UPSEE 2019. Note: After document verification, the candidates will be given a One-time-password (OTP) to log in for choice filling of colleges affiliated with (UPTU/AKTU) UPSEE 2019 along with the courses which they are seeking to get admission. I am right now in pune.. So i want to know that do i have to go to up for documents verification or other processes in counselling or i can do everything online??? You have to go for Counselling. To know more, click here. When will the UPSEE 2017 allotment result be declared? The UPSEE 2017 allotment result will be declared on August 30th 2017. I have not qualified for the counselling process but I want to know how it works. Can I register for the counselling process? Only the successful candidates will be allowed to participate in the UPSEE counselling process. How many rounds of counselling will the UPSEE counselling process have? The UPSEE counselling process will consist of five rounds in total. Who can attend the counselling of UPSEE 2017? Only those candidates who are successful in UPSEE 2017 examination will be required to participate in the counselling process. How is Revaluation and scrutiny of answer sheets done in UPSEE-2017? I need to know what are the documents do I need to carry at the time of counselling? Domicile and Category/ Reservation Certificates etc. I do not have my Rank card, but I remember my Roll no & Rank. What should I do? You can download your Rank card from MTU web site. Otherwise Contact DV & CC Center In- charge. I don’t have Medical fitness certificate// Migration certificate/ Transfer certificate /Character certificate from the Institution last attended. What should i submit? Take part in verification process. You can submit undertaking on Certificate 10 at the time of Document Verification, You can submit these certificate in the institution you would be admitted at the time of admission.